Guardian Technologies‘s reputation for good air purifiers at budget prices makes it the ideal savior for anyone who want a simple and cheap product to save their lives. And the U.S company has come to the rescue with the GermGuardian CDAP4500BCA. 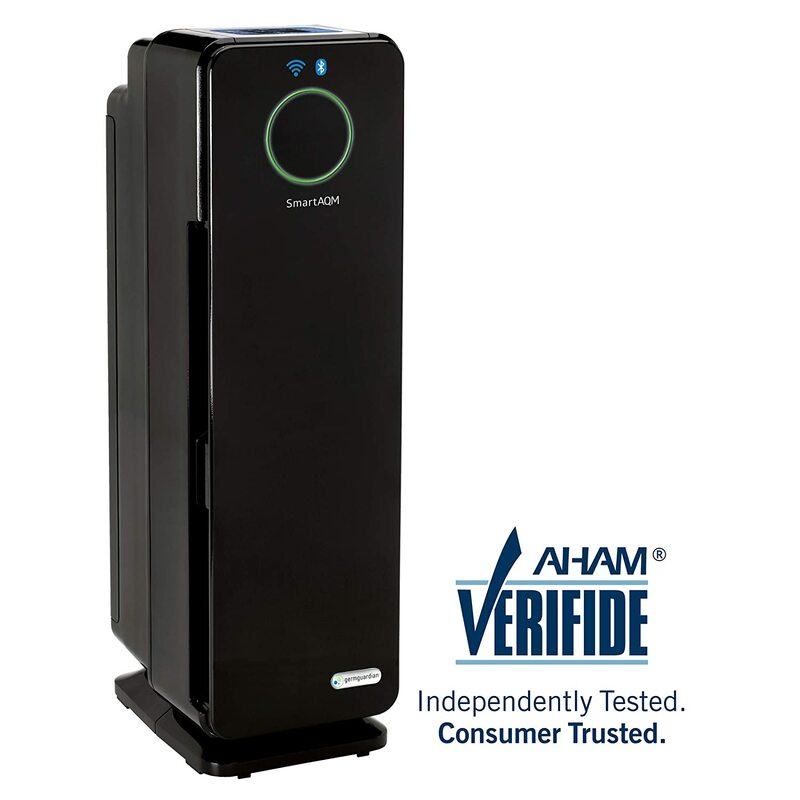 As you look deeper in the air purifiers category of Guardian Technologies, you need a good GermGuardian CDAP4500BCA Review to understand why this GermGuardian air purifier is being the hot pick in 2019 and beyond for this brand. GermGuardian CDAP4500BCA was supposed to offer cheap solution of air purifier running with smart features like Wifi capability and Smart Sensor. That’s why this air purifier is – in reality, a CDAP5500BCA minus 6 inches in height to be put in the desk or table. Now, let’s dig deep in this GermGuardian CDAP4500BCA Review (it is also appropriate for the GermGuardian CDAP4500WCA Review). This GermGuardian CDAP4500BCA is in fact sharing the same design and air filtration process with the taller brother – GermGuardian CDAP5500BCA. That’s why in US and Canada market, the original price tag of this device is equal with its big brother – $249. However, as a smaller one, you can find a good discount for this GermGuardian CDAP4500BCA, with a much desirable price tag of $159. With a more attractive price, the GermGuardian CDAP4500BCA costs you as much as the GermGuardian AC5350B, but with more Smart features. For $149, this GermGuardian CDAP4500BCA is the most affordable Smart air purifier you can purchase these days. There is no alternative option with such generous features, for example the Honeywell HFD-120-Q and SilverOnyx are great, but without the Smart Wifi connectivity. Moreover, if you click in the link below, we will offer you a much better deal. Interesting? GermGuardian CDAP4500BCA 22” 4-in-1 WiFi Smart Air Purifier, Air Quality Monitor, Voice Control, HEPA Filter, UVC Sanitizer with Black Onyx color. You are looking at the best deal for the smart air purification. Grab the deal and get an up to 40% OFF the original price. As we stated earlier, you are looking at a smaller version of CDAP5500BCA. And this air purifier has a White version, which named GermGuardian CDAP4500WCA. If you are looking for a GermGuardian CDAP4500WCA Review, you are in the right place to read it. That means GermGuardian CDAP4500BCA shares all of features with the bigger brother. With a design-wise, this air purifier stays in a black onyx color, making it more beautiful and unique for the brand. The front of the device is still a circular light to indicate the current air quality in your room. GermGuardian names their Smart Sensor function the Smart Air Quality Monitor (or AQM). Also, you will find the back of GermGuardian CDAP4500BCA with an air intake grill. Clearly I don’t like the position of any modern GermGuardian’s air purifiers. It makes me uncomfortable thinking where to put this air purifier. However, as a much shorter version of CDAP5500BCA, this air purifier can be easily put on a desk or a side table. As usual, we will have a modern-looking control panel at the top of GermGuardian CDAP4500BCA. While there’s nothing particularly noteworthy about the way the GermGuardian CDAP4500BCA looks, it is a perfect small devices for personal use, with only 9.45 lbs. You need an air purifier to grab anywhere in your house? Voila. As the most important criteria to the air purifier’s power, basically we will search for how many filters it has and what types of air filters are used. Being one of the latest GermGuardian air purifiers, GermGuardian CDAP4500BCA introduces a 4-in-1 air cleaning process as below. Pre-filter – This filter is a decent pre-filtration combining with Activated Carbon Filter. As a result, this air filter is capable of removing any large objects of pollutants and odors created from smoke, cooking, and pets. 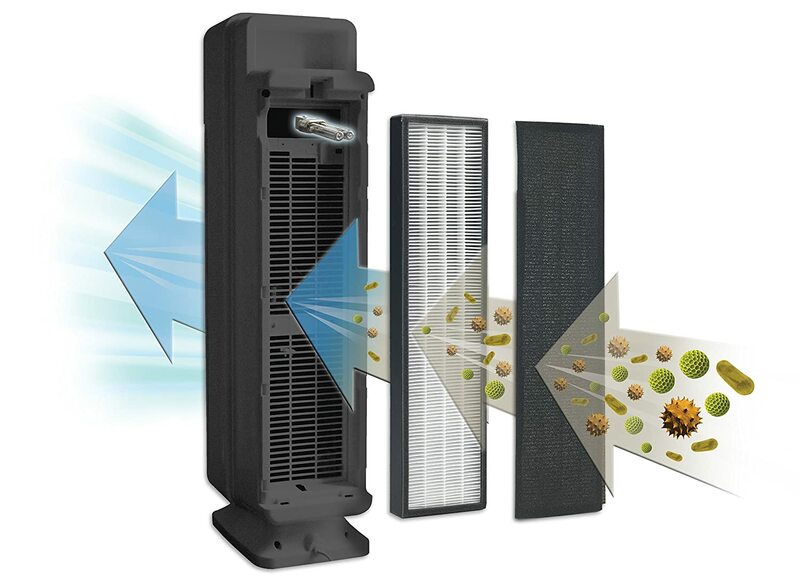 True HEPA filter – GermGuardian CDAP4500BCA experiences the same True HEPA technology from the latest devices of Guardian Technologies, to capture 99.97% of as small as 0.3 microns allergens, dust and mold spores. This filter is including an antimicrobial treatment on it to help prevent against any odors or bacteria from getting trapped in the filter. UV-C Light – This filter is great at killing airborne bacteria, viruses and mold spores that cause health issues by altering the genetic structure of the germ. There is not much to say about the traditional set of air filters in a GermGuardian one. 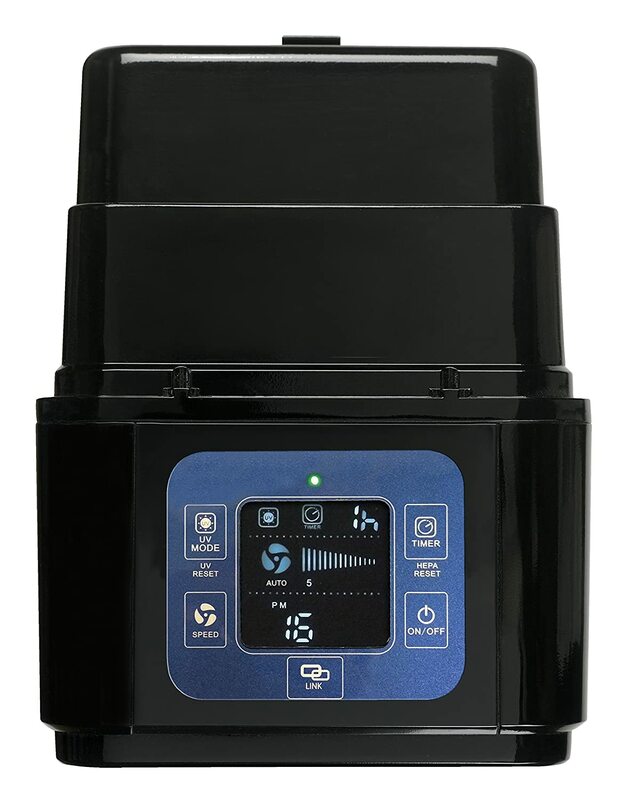 You will have the latest technology of GermGuardian True HEPA filter, with a performance level filtration of 99.97% allergens down to 0.3 microns. In standard conditions, this filter-B HEPA is as good as the latest filter-C from the same brand. The efficiency of this GermGuardian CDAP4500BCA is a little bit down from the taller version – GermGuardian CDAP5500BCA. In the same test conditions of 100-sq-ft room and duration of 1 hour, GermGuardian CDAP4500BCA can only capture 99.7% of as small as 0.3 microns particles. The smaller size and lower fan speed are the culprits to the lower performance. The bottom line of this powerful air filtration process is the UV-C light air filter. Using a low power consumption UV bulb, the performance rating of this UV light can match any other GermGuardian products. 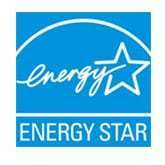 Being the smaller model of this brand, GermGuardian CDAP4500BCA uses the same filter as AC4300, AC4825, AC4900CA. This air filter-B is much more affordable than the latest filter-C, with the same filter duration of 6-8 months. GermGuardian CDAP4500BCA is truly a small air purifier for small rooms. Guardian Technologies makes this device for a humble room size of 153 sq ft. The ACH of GermGuardian CDAP4500BCA stays at 4X. This air changes per hour rating is decent for the room size of 153 sq ft.
Also, the CADR of GermGuardian CDAP4500BCA is 107 Dust/ 99 Smoke/ 116 pollen (cfm). If you choose the GermGuardian CDAP4500BCA, you will have a nearly the same fan power with CDAP5500BCA, with less than $50. Like any other GermGuardian air purifying machines, noise level is not a competitive edge of this brand. That being said, GermGuardian CDAP4500BCA is not an exception with a high noise level at highest setting. However, you can clean the air filter regularly to significantly reduce the noise. The noise level for this GermGuardian CDAP4500BCA is not stated anywhere in its manual. Through rigorous tests, I have measured a stable lowest noise level of 40 db, which is higher than most other normal air purifiers in the same price range. 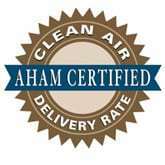 For example, the AeraMax 200 and AeraMax 300 can reduce the noise level as far as 35 db. You will also find the SilverOnyx with 25 db, or the Winix 5300-2 with noise level of only 28 db. At the highest setting, GermGuardian CDAP4500BCA is not a good option for any quiet places, especially your bedroom. The noise level is measured at 55 db, and this is the noise level of public restaurant, something that can irritate a person’s headache. A good air purifier must be used for a long time to be efficient, and in Breathe Quality I’ve been asked many times: “Do air purifiers use a lot of energy?”. We believe that power consumption is one critical factor to decide if this air purifier is good or not. With an only 5W UV-C bulb, GermGuardian CDAP4500BCA consumes a reasonable amount of energy, with a power rated of 60W. This is still a higher than normal power consumption, but it is quite better than other well-known devices like Winix 5500-2 or Winix WAC9500. For using a GermGuardian CDAP4500BCA 8 hours per day, it would cost you up to $22 per year. I don’t say it isn’t reasonable for a common air purifier, but as a small Energy Star air purifier, I expect less energy consuming for GermGuardian CDAP4500BCA. As the smaller version of the well-known CDAP5500BCA, GermGuardian CDAP4500BCA features the same additional features as the high-end models of Guardian Technologies. You will have a true Wifi Smart air purifier with an astonishing price tag of only $150. Using your smartphones with both Wifi and Bluetooth, you can easily control and monitor your air purifier settings. Only the Honeywell HPA250B, Blueair Sense+ and Levoit LV-PUR131S can have this function, but they are more expensive than our GermGuardian CDAP4500BCA. Again, you can make use of the Alexa communication. 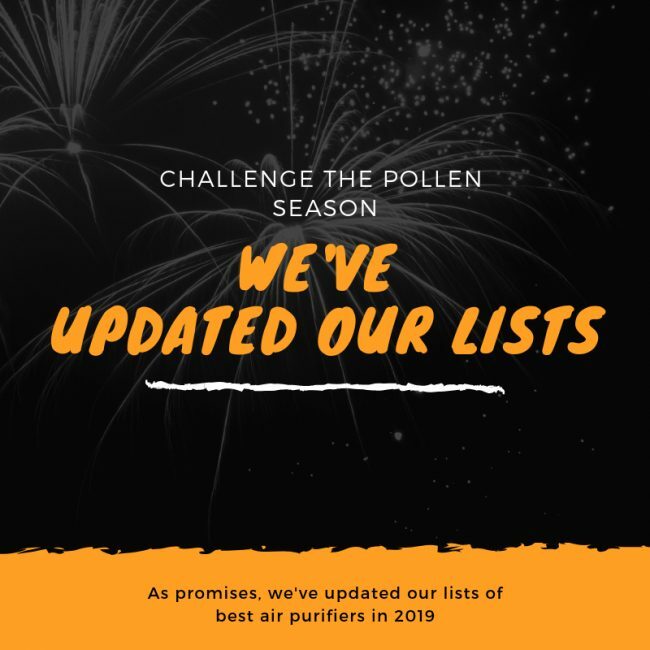 But also again, I am really disappointed with the bad connection with Alexa of another GermGuardian air purifiers. It seems they’d better not add this smart function, GermGuardian CDAP4500BCA may be better. Luckily, you will be happy with the Smart Sensor of GermGuardian CDAP4500BCA. You no longer need to manually control your air purifier, as the Smart Sensor function will automatically adjust the fan speed according to the actual environment level. Just so you know, this function is mostly found on high-end air purifiers. They have occasional Free Shipping policy, as well as a great discount on all products (most popular 10% to 20%). Whenever you find their air purifiers not as great as you previously thought, you can return them within 30 days of your original receipt of the order. And don’t worry about the warranty policy of Guardian Technologies, as they warrant their products to be free of defects in materials or workmanship. You can register for a warranty in up to 3 years for the small devices, and up to 5 years for others. For the GermGuardian AC4825, GermGuardian AC4900CA, GermGuardian AC4300BPTCA and GermGuardian CDAP4500BCA, you will have a 3-year warranty. GermGuardian CDAP4500BCA 22″ 4-in-1 WiFi Smart Air Purifier, Air Quality Monitor, Voice Control, HEPA Filter, UVC Sanitizer with Black Onyx color. If you are a fan of GermGuardian, you may easily fall for this GermGuardian CDAP4500BCA air purifier because it has a same performance rating with latest device but a much more affordable price tag. Though the Wifi Smart feature is not actually good, this air purifier is still great with a powerful air filter process and accurate Smart Sensor. However, we honestly advise you to stick with the lower models of GermGuardian, like GermGuardian AC4300BPTCA, GermGuardian AC4900CA or GermGuardian AC4825. Should I buy GermGuardian CDAP4500BCA? Yes, and this is the best air purifier with the smart feature of this brand that you should buy. This is also the most affordable device that allows you to control via smartphones. If you have serious allergies or asthma to airborne pollutants: the GermGuardian CDAP4500BCA is great with the combination of True HEPA filter and UV-C light filter. If you want a better performance, or better fan power to clean your room faster: you can choose between the AeraMax 200, Blue Pure 211, Honeywell 50250 and Honeywell HPA300 for a better fan power. If you need an air purifier with a better room coverage: you can choose the SilverOnyx, Alen Paralda or Alen T500 with manufacturer’s suggested room size of 500 sq ft. The Winix 5300-2, Winix C535 and Winix 5500-2 can clean a room of 360 sq ft, and they are double the room size of this GermGuardian CDAP4500BCA. If you need a budget version of this air purifier: you should opt in for the GermGuardian AC4825 or GermGuardian AC4900CA. If you love the additional features: this air purifier is enough for your craving of smart features. GermGuardian CDAP4500BCA is more or less the smaller device flagship of this brand with the cost reduction of $50. It is simply the best choice for a Smart air purifier at the moment.